A smart, talented pony with a brain that is hard to find. He moves for fun and is naturally uphill, jumping well and ready to compete. George has been broken since the end of September and riding away since October, attending his first outing under saddle at the end of October taking it all in his stride. He has since been to unaffiliated dressage and showjumping competitions with success. Training regularly and showing improvement every time. He is schooling well on the flat with a very trainable attitude and is always willing to please. Has been out hacking in company along busy roads across open common land, frequently ridden in open spaces, has hacked alone but a tad green. Introduced to fences(showjumps and cross country) showing enthusiasm and technique, not phased by fillers and water trays. Has been shown lightly in hand since a foal with pleasing comments from judges. George is a sweet, gentle natured horse who is a pleasure to have on the yard, never pushy or rude. Good to clip, good with vet, farrier and dentist, also loads and travels well. George is out of a Welsh D mare, and sired by CHAKRAVARTI a British Warmblood. 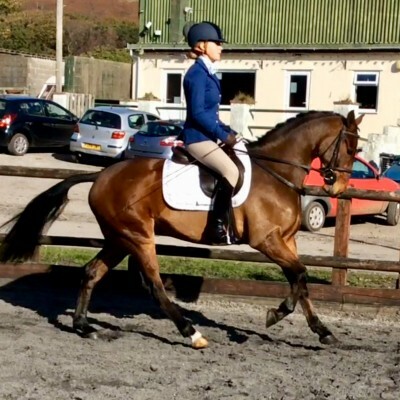 CHAKRAVARTI has competed at RIHS as a riding horse, and is currently competing and winning at novice level BD. George is a very special boy who is sure to go far in the right hands. Videos available on request (easiest through WhatsApp) a pony not to be missed!